Lorraine and Alexander Harik's tangy, authentic Middle Eastern condiment will be your new kitchen MVP. Hummus and tahini long ago made their way from the Middle East to become beloved American staples. 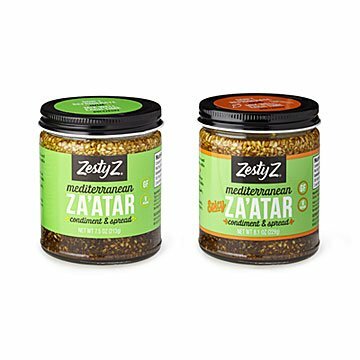 Now, from the same part of the world, there's a new condiment kid in town: za'atar. Lebanese-American mother-son duo Lorraine and Alexander Harik's spreadable version of the tangy, herbal, slightly nutty mix is the authentic, third-generation family recipe they both grew up with. Their small-batch blend of wild Middle Eastern thyme (the main ingredient), oregano, deep red sumac (which adds an astringent, less-tart-lemony flavor), toasted sesame seeds, and virgin olive oil adds a pop of color and flavor to almost any savory dish: vegetables, potatoes, pasta, sandwiches, eggs, yogurt, dips, salads, breads, marinades, dry rubs, and snacks. (On popcorn, it's a revelation.) It's vegan, never needs refrigeration, and instantly makes any healthy food addictive—but still good for you. The foodie radar has finally picked up on za'atar, but as Alexander says, "not all za'atar is equal." This one rules. The set of two includes both the original and the spicy (same as the original, but with chili pepper). Handmade in Brooklyn, New York. Click here for recipes using the Mediterranean Za'atar Spread. Alexander Harik was born in New York City, but spent childhood summers on the coast and in mountain villages of his family’s native Lebanon. As he grew older and started his career, he wasn’t able to spend so much time there. He longed for the aromas and flavors of his mother's kitchen, especially the za’atar. When Alexander realized he couldn’t find this essential flavor and spread anywhere but home, he quit his finance job and, together with his mother, Lorraine, set out on a mission to introduce America to the tangy herbal condiment enjoyed by millions in the Mediterranean and Middle East. Naturally, they make it with their third-generation family recipe. No refrigeration needed, even after opening. Truly sensational flavor and consistency, delicious mixed with hummus, Greek yogurt or just bread. Haven't tried the spicy one yet, but I know I'll love it just as much :) and you can also use it as a spice when roasting chicken, veggies, potatoes, etc. I had never used Za'atar spice before, and figured this spread would be a good introduction. It has a great savory flavor, a good amount of tang from the sumac, and the sesame seeds add great texture and nuttiness. It's very easy to use, just stir and spread. It's great with hummus and on chicken. I only gave four stars because it does NOT look appealing at all. My mother-in-law lived for many years in Israel. Za'tar is a favorite there, and this condiment allows her to give her foods that Mediterranean kick that she often misses in American recipes.